1. In a small bowl, whisk the chicken stock with the low sodium soy sauce, chile garlic sauce and cornstarch. 2. In a large non stick skillet, heat the vegetable oil until shimmering. Add the ginger and stir fry over moderate heat until they are softened, about 1 minute. 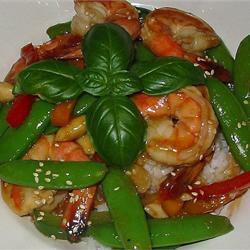 Add the snow peas and stir fry until they are crisp-tender and the ginger is beginning to brown, about 2 minutes. Add the shrimp and stir fry abot 1 minute. Add the scallions and stir fry for 30 seconds. Whisk the chile sauce, add it to the skillet and stir fry until the shrimp are opaque throughout and the sauce is thickened about 1 minute longer. Serve with brown rice.